Cocoa Butter naturally contains essential fatty acids that are beneficial to our skin. Cocoa Butter is used in a variety of cosmetic, toiletry and pharmaceutical applications to reduce cutaneous dryness and improve skin elasticity. Lipstick, a delicious chocolate bonbon, and soft hand lotion. Exactly what is Cocoa Butter? Cocoa was named Theobroma by Linnaeus, meaning 'food of the gods', due to the goodness of its seeds. The genuine Cocoa tree is a small and handsome evergreen tree that grows in South America and the West Indies from 12 to 25 feet high and branching at the top. The deodorized Cocoa Butter is obtained from the fruit of the Cacao tree (Theobroma Cacao). The butter is extracted from the seed kernels and is further refined and deodorized to yield a white colored butter with little odor. This is a relatively hard butter with a steep melting curve ideal for body care products. Why is it good for the skin? Cocoa Butter naturally contains essential fatty acids that are beneficial to the skin. Cocoa Butter may be used in a variety of cosmetic, toiletry and pharmaceutical applications to reduce cutaneous dryness and improve skin elasticity. Cocoa Butter is an emollient that has been used for centuries as a skin care product. Cocoa Butter has been used to heal and moisturize skin that has been exposed to harsh conditions. Cocoa Butter also helps reduce the formation of stretch marks during pregnancy by keeping the skin supple. Perfect for those who love the smooth natural chocolate smell. Unrefined and Natural Cocoa Butter has a hint of cocoa and is darker. Perfect for those who want the benefits of cocoa butter without the cocoa scent. 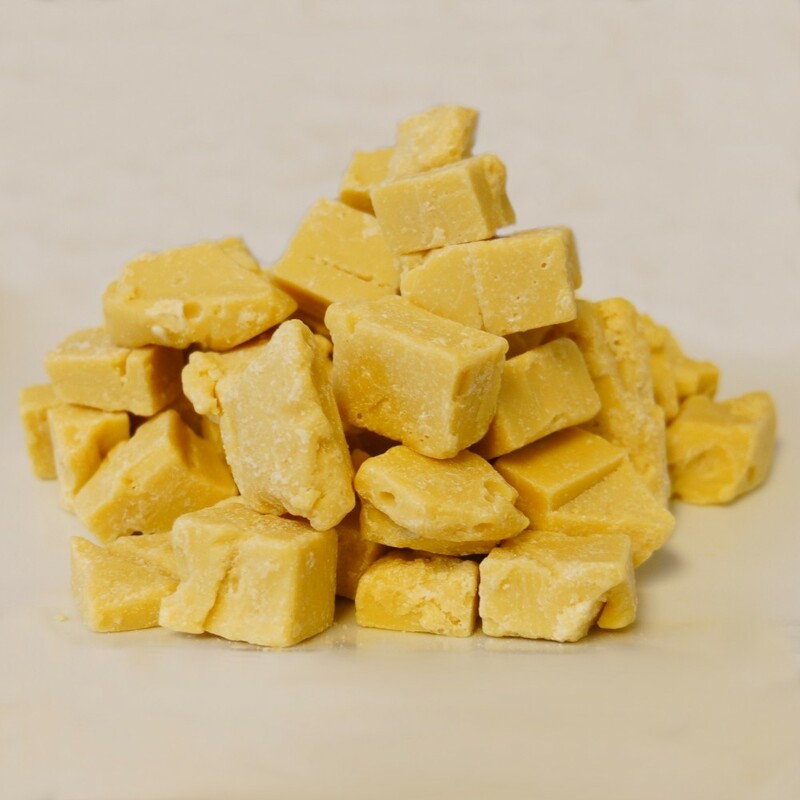 Pure, Prime Press Cocoa butter in easy to melt, smaller, more uniform chunks. Same rich, chocolaty smell and beautiful golden color. This caliber of Cocoa Butter is a wonderful ingredient in lotion bars, lip balms, body butters, soaps, and belly balms for expectant mothers. Cocoa butter is also a great binder for bath bombs! Cocoa Butter is a great emollient that has been used for centuries! Essentials By Catalina is not responsible for compatibility of this Product. We encourage everyone to Sample and Test prior to committing to larger quantities.